You just can’t go wrong with a good slider, right? There’s just something about mini-sandwiches that makes them the perfect appetizer. For me, it’s probably the extra bread you get with the bun, because you know, I’m a recovering carb-o-saurus. The other good thing about sliders is they are so versatile. You can literally make a slider out of almost anything! Chicken parmesan is probably one of my favorite dishes to make and it’s on my menu rotation almost weekly. 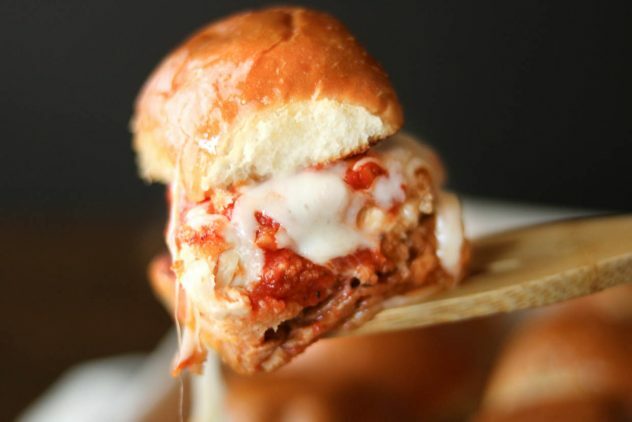 #sorrynotsorry I decided to mix it up a little bit and I thought, how about chicken parmesan sliders?!? Winner! 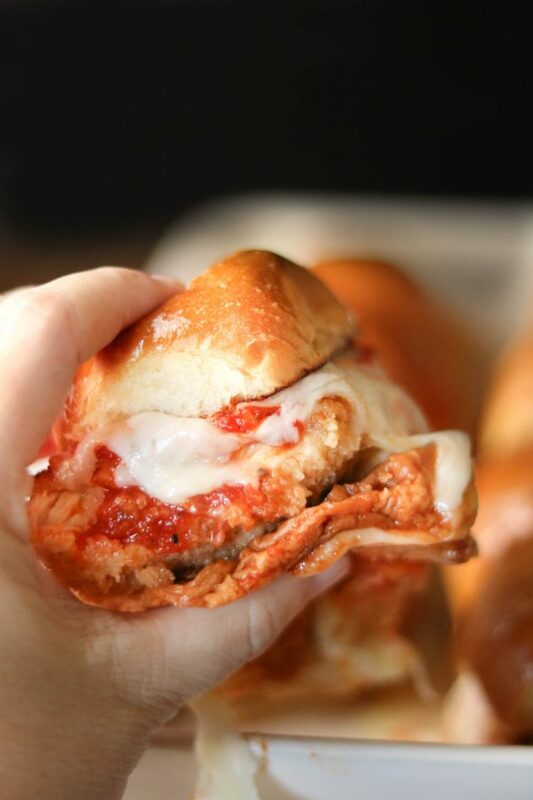 I used to love the Italian chicken sandwich I could get at a little dive bar in my hometown. You know, the frozen ‘chicken’ patty with a pocket of mozzarella cheese in the middle, with a little sauce on top. Man, was that a good sandwich (but not so good for you). So when I started dreaming up these chicken parmesan sliders, my goal was to recreate that sandwich but in a healthier, 2.0 version. 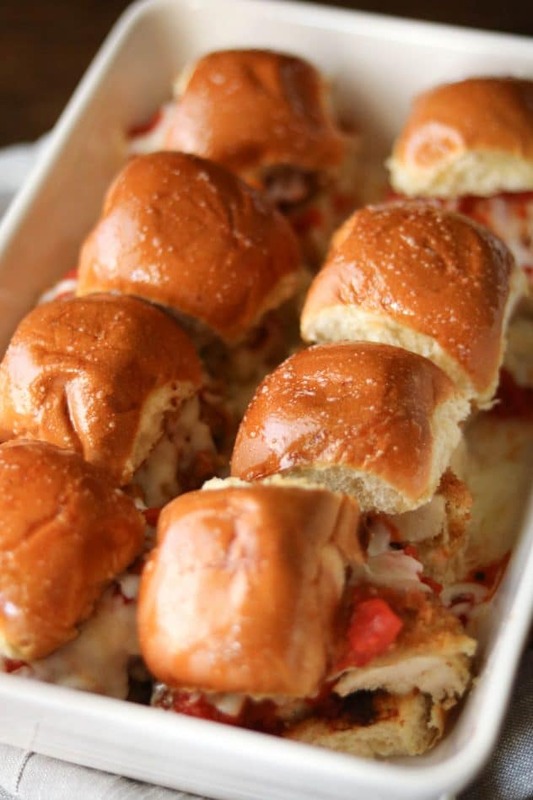 Bring these chicken parmesan sliders to your next picnic, tailgating party, or get together because they will be an absolute hit! In a small bowl, whisk together the eggs, salt and pepper. In other bowl, add the flour. Then, lay out a sheet of parchment paper and spread the bread crumbs, mixing in the Italian seasoning. I like to place my bread crumbs onto parchment or wax paper for easy coating. In a large skillet, melt 8 tbsp. of butter (one full stick). Once the butter is melted, begin coating the chicken. First dip into the flour, then into the egg, then finally coat with the bread crumb mixture and place into the pan to cook. Continue until all pieces are coated and cooking. Cook for about 5-6 minutes on each side or until cooked through. While the chicken is cooking, preheat the oven to 350 degrees F.
Melt 4 tbsp. butter in a small dish and add the garlic powder. Using another skillet, brush the inside of the slider buns with the butter and toast. 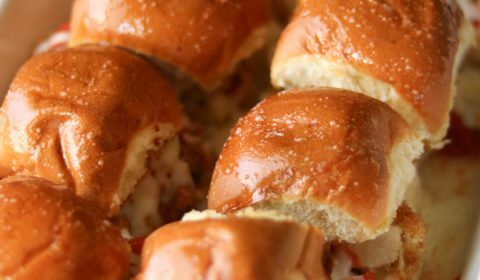 Place the slider buns into a 9×13 dish, or 2 8×8 dishes. Once the chicken is finished cooking, start assembling the sliders. Add the chicken pieces, top with shredded mozzarella cheese, then a little sauce. Brush the top of the buns with butter and place into the oven for 10-15 minutes.